The first step of the recipe instructs to dissolve a quarter of an ounce of rock alum in one ounce of “acqua rosa” (rose water), which was then added to a quart of “allume bruciato,” or calcined aluminum sulfate. This mixture was then placed in a “digestione,” which was an alchemical apparatus for distillation that dissolved a body in water or alcohol over mild heat. The recipe calls for the mixture to be heated for an hour and until clear. The second step in the recipe is to dissolve a quarter of an ounce of lead acetate in an ounce of distilled vinegar with one forth of pulverized candied sugar. For the third step, a fourth of pulverized copper sulfate from Cyprus is added to an ounce of “acqua di piantagine.” The fourth step calls for calcined red, or Roman vitriol (sulphuric acid) to be boiled with two ounces of urine from a healthy creature. The fifth and final step is to combine an ounce of strong lime into an eight of sublimated and pulverized mercury, which is “digested” to a clear heat for an hour. Once these five steps are completed, everything is to be mixed together in a flask for sublimation and to “digest” for twelve hours. When I first came across this recipe I was unsure what to make of it, and its inclusion in a pamphlet dedicated to the act of tinting marble perplexed me. But as it turned out, this funny little pamphlet held the key to better understanding Anna Maria Luisa’s recipe collection as a whole. Recipes collected by women are traditionally viewed as domestic manuals used to safeguard the health of the home and treat commonplace illnesses. 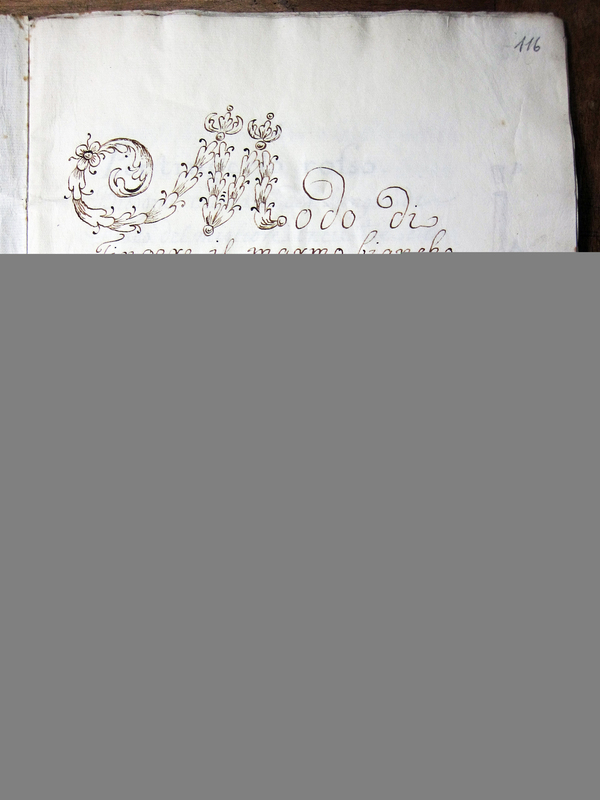 In general, and as previously discussed here on the Recipes Project, recipes were “repositories for useful knowledge” and share a desired goal to unlock nature’s secrets. In the case of Anna Maria Luisa, however, useful knowledge extended beyond the preparation of simples and household medicines. Her recipe collection reveals an interest in collecting and amassing experiential alchemical knowledge. The creation of styptic water used the same ingredients, apparatuses, and alchemical processes detailed and drawn in the recipes for marble dyes that preceded it. 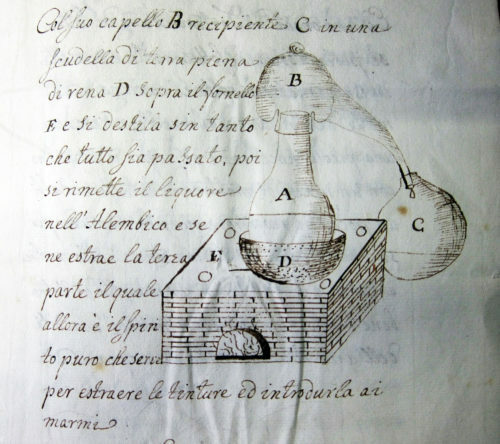 Detailed illustration showing how to set up the necessary alchemical apparatuses to create the marble dyes and styptic water. In addition to highlighting one Princess’s interest in alchemy, this pamphlet also speaks to two important issues when studying early modern recipes from a modern perspective. First, science, medicine, and technology at the late Medici court existed in a world in which our modern categories of knowledge simply did not apply. 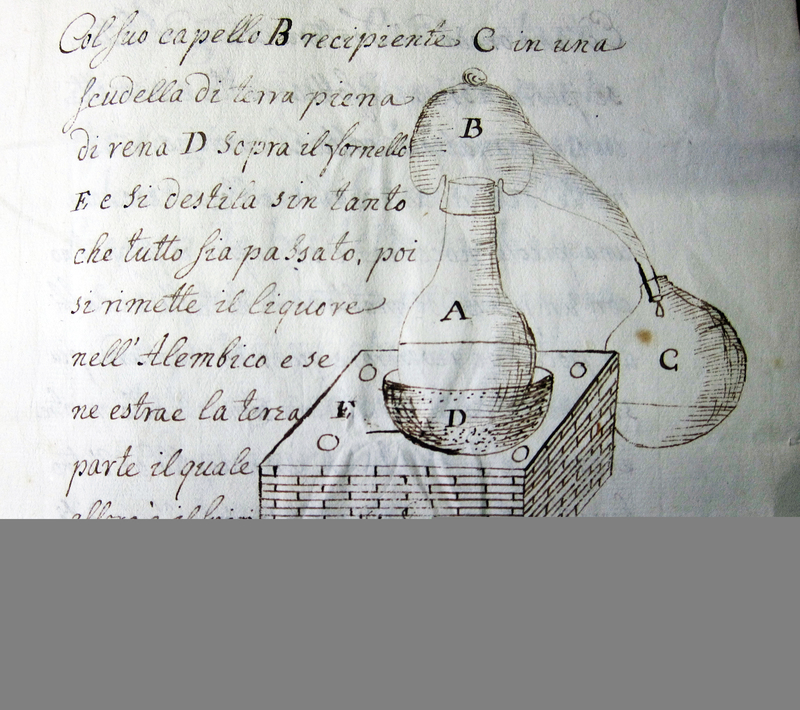 In eighteenth century Florence, artisanal practices, science (or natural history), and medicine were closely connected thanks to alchemy. 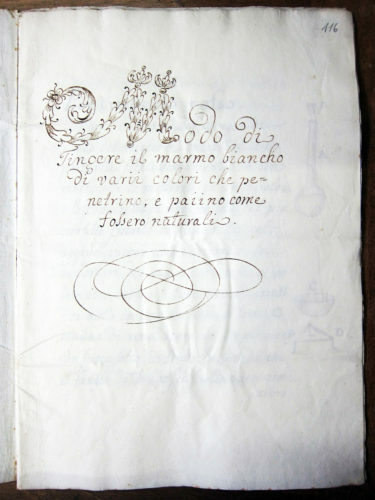 For the late Medici court, alchemy was not associated with the mysterious or the occult. Alchemy was an applied science that used experimental activities to investigate and transform nature. These practices produced experimental activities in metallurgy, refining salts, producing dyes and pigments, the manufacturing of man-made gemstones and stones, glass and ceramics, and the creation of chemical medicines. Each of these seemingly disparate pursuits were united by process rather than the specific product produced. tThis early modern emphasis on process over product brings me to the second issue concerning the studying early modern recipes. While recipes are certainly important historical objects, they are often closely associated with or celebrated for the product they produce. This emphasis on product over process, however, can belie the true value of many recipes. As is in the case of the styptic water. 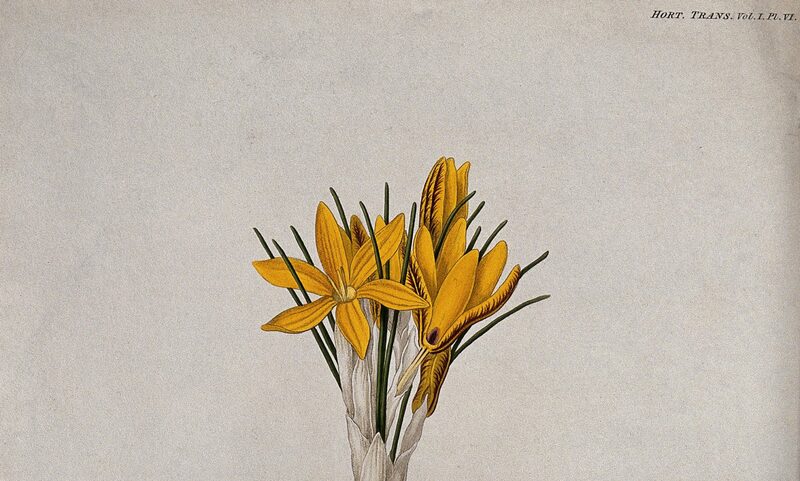 Was Anna Maria Luisa interested in tinting marble or was she interested in better understanding complex alchemical processes that could transform nature and the human body? Thanks to this pamphlet, I now argue the latter.